Actor, playwright, stand-up comic, theater director, choreographer, and former serial dater, Antonia Kasper is a force of nature. A Theater graduate of Tulane University, she has studied in New York City at Circle in the Square, Playwrights Horizons, and The Actor’s Studio. Antonia has also studied theater in Wales, acted in shows at the Edinburgh Fringe Festival, and directed multiple plays abroad, including A Clockwork Orange, Brigadoon, West Side Story, and A Funny Thing Happened on the Way to the Forum. While in Europe, she wrote and performed her first one-woman show, KAT, playing eight different characters and receiving critical acclaim from The Guardian. 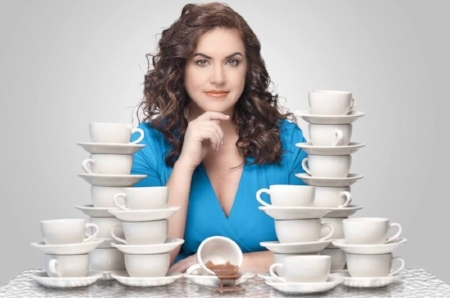 On October 15, 2018, in New York City, she revives her other critically successful one-woman show, 45 Coffee Dates. Brent: Your one-woman show 45 Coffee Dates is coming up on Monday, October 15! How do you remember all that material? Antonia: In an older version of the play, I had the piece in a very linear timeline. But because the childhood scene that started the show depicted more drama than comedy, my director Katherine Elliot and I moved that scene later on the story. Now it's more of a flashback. Besides that one scene, everything is pretty much in sequence, so it’s not too difficult to remember the overall order of scenes. Brent: What is the show’s arc? Antonia: The different characters pretty much go from bad dates to worst dates to the worst of the worst dates. Brent: Yikes, so it’s a progressive downward spiral! Still, how do you commit it all to memory? Antonia: I rely on the old-fashioned ways of memorizing. There are six things that help me memorize scenes and their order. Antonia: The first is the blocking, or where I am in the space. Brent: Right, associating physical spaces with lines is a time-honored technique. What comes next? Antonia: Second, the rhythm of the words in the sentence or the paragraph—or using association to get me to the next sentence or section. Maggie: Alaska's the place, Rach! I would go with you, but I'd be tempted to sleep around just to stay warm. Rachel: Aren't you looking for something more meaningful? Maggie: Meaningful? Like what, marriage? So "warm" triggers the next line, "meaningful," and "meaningful" triggers the following line "marriage." Lots of "m" sounds. I find if you get the main words linked, then the rest of the sentence becomes easy upon repetition. Brent: Exactly. Trigger is the operative word. All you need is that small prompt to move ahead. What else? Antonia: Third, any sound and lighting changes, or cues to get me from one scene to another. I love having music segues from one scene to the next. Brent: These cues are like an extension of the physical space. Antonia: Fourth is repetition, repetition, repetition, especially while doing a daily task. Brent: Performers tell me they are constantly running lines through their head during the day, so this isn’t surprising. Antonia: I usually repeat the weaker scenes while doing the dishes or walking my dog. The only thing is everyone thinks I'm another crazy person. Thankfully, New Yorkers are used to it. I live in the Theater District in what is known as The Actors Building, so you would think the neighborhood would be used to people memorizing their lines. When I was preparing for my last run of 45 Coffee Dates, I was going over my lines a lot while walking my dog, speaking very softly so no one would hear me. Sometimes I would prolong the dog walking by taking my dog down or around the block a few more times than usual so I could finish a scene or segment of the play. Brent: Sounds perfectly normal to me. Antonia: A few weeks later, I mentioned to my doorman that I was rehearsing a solo show. He said, "Oh, that's it! Thank goodness you are okay. Someone told me that they thought you had lost your mind since they saw you talking to yourself and pacing up and down the block." Brent: What is your take-away from that interaction? Antonia: Do what's right for you to memorize. And if you see someone talking to themselves, they're either on a Bluetooth, completely crazy, or an actor memorizing lines. Brent: That is the reassuring thing about New York City; you’re never the most eccentric person on the street. And the final two things? Antonia: Line and blocking speed-throughs, and working with a friend who is also on book for you. Brent: Carole Schweid, who was in A Chorus Line back in the 1970s, first told me about speed-through rehearsals. The goal is to know your lines and positions so well that you can tear through them quickly and clearly. And others, like James Gleason, have touted the virtues of running lines with someone else. Still, you’re human, so what can derail you? Antonia: The only thing that can sometimes completely throw me is when I'm in a new space that I haven't had enough rehearsal in or I decide to (or accidentally) change the rhythm of the words in the sentence. If the acting is different, sometimes the rhythm changes. Sometimes that can be a good thing! A change in rhythm can sometimes improve the acting because it's different or new or better way of saying something already memorized. But it can also throw an actor off course. Brent: That is one of the hazards of performing one’s own material. Antonia: I really hate when people say, "it must be easy to do your own work; I mean, you wrote it so you know it!” Or “no one knows it but you, so you can't mess up lines!" That's totally wrong. Brent: I’ve heard that from actors like Charles Busch and Noni Stapleton. All that freedom may tempt you to veer off track, or tinker with it non-stop. Antonia: It's more difficult memorizing your own work than someone else's work because you know all the different versions, all the edits, and all the revisions. Brent: What kind of questions do you ask yourself in your mind? Antonia: What version am I in? Did I edit that? Do I want to put that word, phrase, or scene back? Is "a" better than "the" here? Should I go back to the original sentence? Can I find a better or funnier or sadder or more poignant way of saying this? So it's difficult to fully take off the writer hat and only wear the actor hat. Brent: Sounds stressful! What keeps you anchored? Antonia: I have to say even when my performance might be off, it's nice to hear from other actor friends. "I'm just amazed that you wrote all of that and memorized it and were on stage for that long without another actor, break, or backup. What courage!" So when I'm down on myself for flubbing a line or action, I try to remember all that I have accomplished. It ain't easy being on stage solo, but it does challenge one to be an even better performer. Brent: What are some other pros and cons of performing one's own work? Antonia: The pros are you don't have to wait until someone casts you for a part that they think you might be right for. And it's pretty rewarding when the audience members make positive comments on your performance as well as the written material. Antonia: It might also be cathartic of your past if it's autobiographical. However, that can also be difficult when you feel you have finished that journey or chapter in your life, but you have to relive it again for the performance. So, repeating those experiences can be good or not so good depending where you are in your life and in your project. Brent: Interesting perspective. Ideally, you find a way to compartmentalize the episodes so that they don’t traumatize you. Here’s my last question. I’m really curious about how you associate the 45 numbers with each of the dates. Antonia: Well, #1 is the sports guy who ignores me. It's the date where I don't know what I'm doing and that I spruce up for only to realize that sports is the only thing Bachelor #1 is interested in. And then there are the one-liners. "Bachelor #3. He was wearing a toupee that looked like a rat died on his head. Next." I look at #3 like he has three heads, which triggers the "head" and "toupee." Brent: Ah, triggers again. All you need is that association of three heads to link to the appearance of his head. And the lines just flow out from there. You have tremendous perseverance. Is that true in general in your life? Antonia: Yes! And that is my advice to everyone: keep going! If you are a writer, keep writing! If you are an actor, keep acting! And if you are trying to find a special someone or a companion, keep going! It's never too late for self-discovery. Or love! I met 45 men in 90 days. Not only did it teach me a lot about myself, but I finally found my future husband, had a child, and found my show! Brent: Wow, well that is quite a testimonial! Congratulations on all these achievements. You are unstoppable! Antonia: Thank you so much! Come see the show! 45 Coffee Dates—In search of my soul-mate through cyberspace and beyond! With her biological clock ticking, thirty-eight year old New Yorker Rachel Yardley is propelled into doing something that goes against everything she believes in—Online Dating. Challenged by her sister’s dare to meet 50 men in 90 days, Rachel rises to the occasion. While desperately speed dating at Starbucks, she questions her past choices in ex-boyfriends, abusive/abandonment issues with her father, and why the only unconditional love she has ever known is with her dog. Take the humorous and timely rollercoaster ride as Rachel Yardley races against her biological clock to find Mr. Right (and possibly conceive a child). Can this woman who feels “past her prime” find true love in a city where the odds are against her?